« Amish Fiction: WHAT THE ?!?!?!? This is one of those posts that is antithetical to the Holiday season on one level. With Hanukkah starting today and Christmas just over the crest of the hill I should write about lovely things. Instead, I’m shedding light on a thing that make me flame and smoulder just like a Yule log. Because I’ve been happy and had wonderful times (point of fact: I’m still happy) but I took my meds and now I’m just tired and sick and cruddy-feeling. So this is my Festivus Airing of Grievance, I guess. I already went bonkers about this on FB on Saturday, because that’s when I first found out what this ugly doll is for. Like Cabbage Patch dolls, each creepy red turd of a doll is “adopted” into a family. 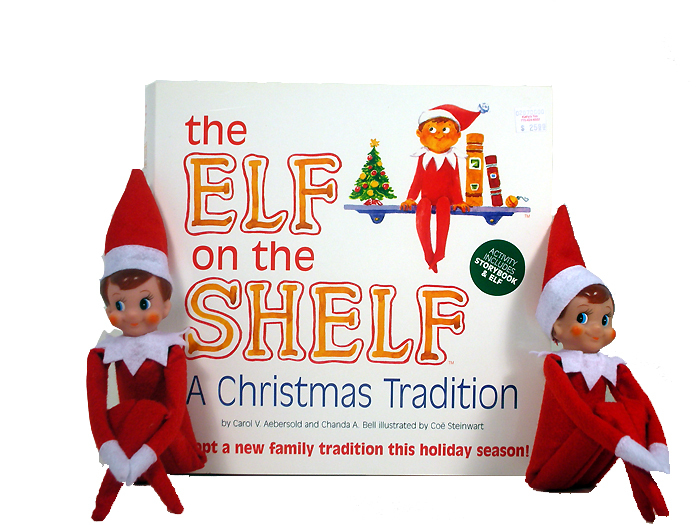 When they read the Elf On The Shelf book together, the Magical Elf “comes to life” and hangs around the house until Christmas Eve to report on your children’s behavior to Santa. First off–If he were real, Santa should know full well that the Quartering of Troops is unconstitutional. So way to violate the third amendment. More importantly, though, I’m one who believes that Santa is lying to children and setting them up for later disbelief in the other mystical loving figures we’ve introduced to them. Who is going to be eager to trust in Jesus when all those other fellows–the elves and bunnies and fairies–are botched con jobs? So this elf thing is just one more way to make the Season of Light into the Season of (Not As Harmless As You Think) Deception. Even if you are among the majority of parents who don’t see that much harm in Santa–and I know that’s most of the world–I’d think you should see the deeper problems embedded in this toy’s philosophy. Over the years as I’ve complained about Santa, many of you have told me in person, email or comments here the very good reasons you have for embracing that tradition. But the elf? The whole purpose of this thing is to teach children to be good because they are being watched. And that’s the same problem I have with the whole WWJD phenomenon and the “Jesus Is Watching” method of instilling good behaviour. We do not do good because we are being watched. You don’t turn in a wallet you found lying in the street just because someone else might have seen you pick it up. You don’t refrain from killing an obnoxious co-worker just because the police can hunt you down with luminol and fingerprints. You don’t refrain from stealing your neighbour’s doormat just because they have a picture window looking out from the front of their house. We are good because that is the character we wish to develop in ourselves. We wish to be kind people so we treat others kindly. We wish to be honest so we behave honestly. As the bumper stickers say: Character is who you are when nobody is watching. Life isn’t prison, where people are paid for good behaviour. Children are not foreign governments who require intense negotiations and subsidy payments for agreeing to be on good terms with the Parental Nation. You as a parent undercut your own position of authority when you advance the idea that goodness is salaried job. As a direct side result of your FB posts, I ended up trying to explain this whole “tradition” to my husband. His reaction was mockery, and then a cut to the chase: just replace the doll’s head with a camera and tell them it streams to Santa’s workshop, if survelliance of your children is supposed to be the motivator. I tend to agree. “Direct side effect”? Oy veh. Serves me right for trying to post while I eat. This simply doesn’t stand up to hundreds of years of actual data, at least not in America. You would THINK it would be true, but it’s just not. I’ve seen Elf on the Shelf’s (or would it be Elves on the Shelves?) around for a long time; but it seems everyone is talking about them this year. I agree with your thoughts on the Elf on a Shelf and fear-based motivation in general. But I don’t really agree that Santa is a deception. Santa is alive and well in everyone who rewards good behavior in others, without expecting anything in return. The lesson of Santa isn’t “be good so you can get presents,” it’s “give your appreciation to those in your life who are doing good.” He’s karma, and he’s generosity, and he’s so much that isn’t so easy to explain. And he’s certainly not the first personification of abstract concepts to make them easier to understand. The tooth fairy? A deception (though one I still find relatively harmless); but Santa? Oh, he’s very real! I think you’re being overly broad and misapplying adult behavioral expectations to children. I’m going to post a response on my blog. Ha, oh I love the “quartering troops” comment.